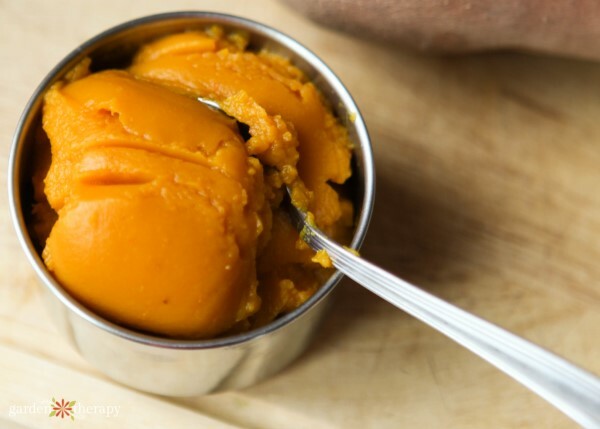 Pumpkin is a healthy source of fiber and nutrients for dogs. It helps them digest meat and bones, especially when they are on a raw food diet. Moreover, pumpkin is also a natural remedy for, well, flatulence in dogs. It’s not a pretty subject to read about, but it’s even less pleasant to experience in person. 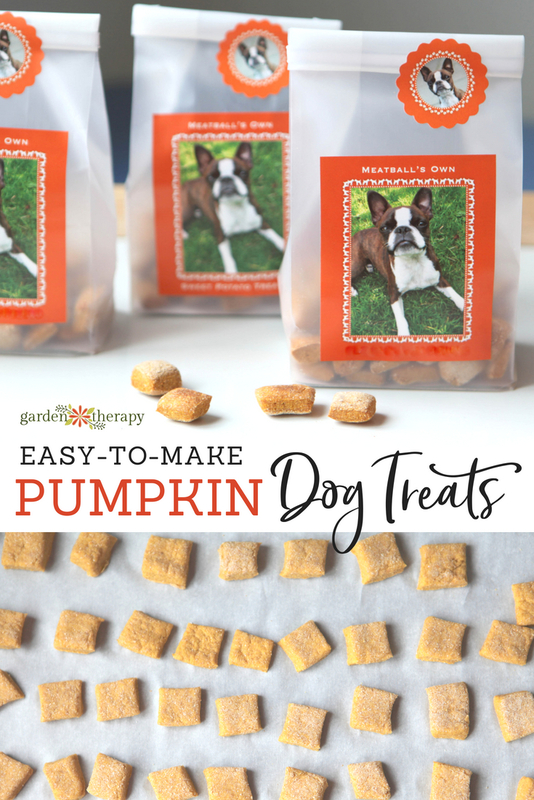 So if you have a Windy Mindy who loves to cuddle with you on the couch, then perhaps these pumpkin dog treats will make TV time more tolerable (and her tummy will feel better, too). I feed my dog a raw food diet, which consists mostly of ground-up raw meat, bones, and offal. It’s full of nutrients and very close to the diet of wolves. My pampered pooch isn’t much of a hunter and, as such, he needs a bit of roughage added to his diet. That’s how these pumpkin cookies were born. 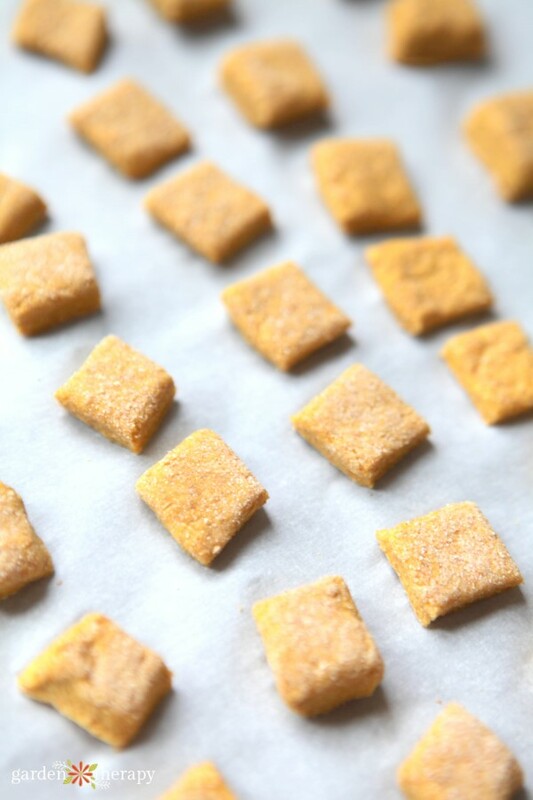 To add a little healthy fiber into my dog’s diet, I made these quick and easy pumpkin biscuits and I was surprised at the response. I didn’t expect him to love them. I thought he would just sort of tolerate them enough to eat them and get some much-needed fiber. I didn’t add any flavoring or strong-smelling ingredients like peanut butter or bacon, and yet he went absolutely crazy for these cookies! I guess it’s a treat just being given a biscuit that is made with simple, real ingredients. I’m so pleased because these treats give him the fiber he needs and help ease his flatulence, which is great news for everybody. Here is how to make them for your favorite four-legged friend. Preheat oven to 350 degrees F. Use 1 cup of cooked and pureed pumpkin for this recipe. If you choose to use canned pumpkin, be sure to get unsweetened pure pumpkin, not pumpkin pie mix that has added sugar and spices. Beat the egg and add it to the pumpkin in a large bowl and mix well. Add in the flour, stir, and then transfer the mixture onto a non-stick surface. Kneed it until just mixed and use a rolling pin to make it ½” thick. Tip: use a little extra flour on the non-stick surface and the rolling pin to prevent sticking. 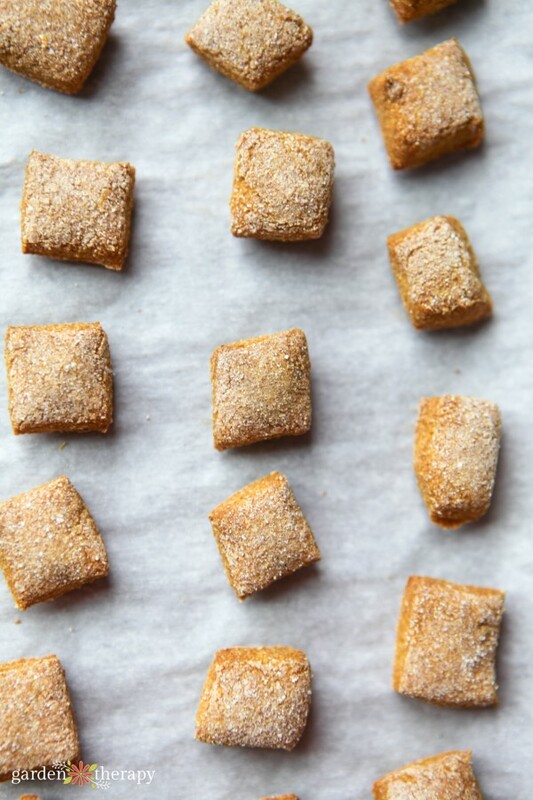 Transfer the dough onto a cutting board and cut it into a grid of biscuits that are approximately ¾” square for a small dog or 1” square for medium and large dogs. Bake for approximately 30 minutes, or until golden brown. These biscuits will be a bit hard for your teeth, but pooch will love the crunch! If you want to give these treats away as gifts, add them to plastic gift bags with personalized labels. Be sure to check out our pumpkin archive for all things pumpkin! 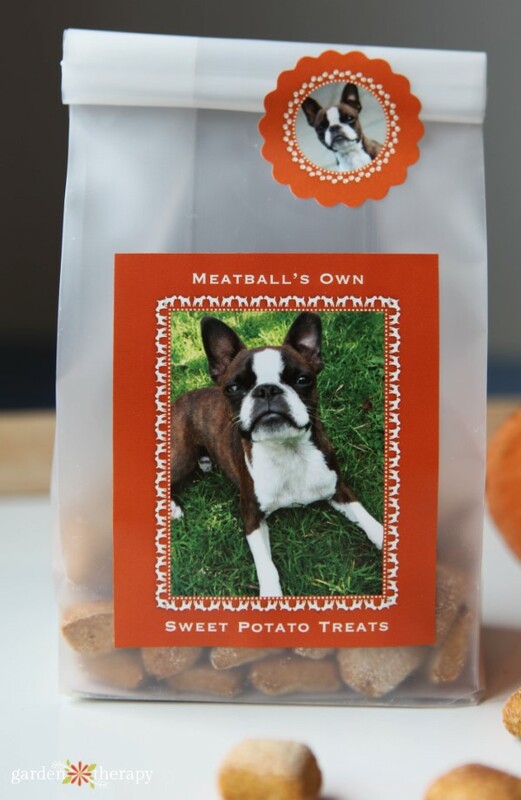 Do the pumpkin dog treats require refrigeration? Thank you for the recipe…. Hi Diane, great question. 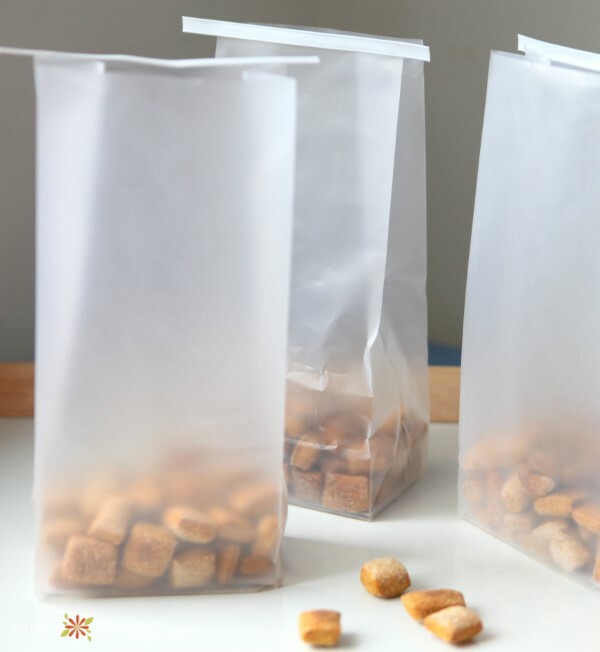 They do not require refrigeration and will last just as any homemade cookie or cracker would. Cooler temps will allow them to stay fresh longer but I’m pretty sure that you will run out before they need to be chilled! I am really enjoying your articles. I find them relaxing and the photos are well done. I don’t travel a lot, so have enjoyed your photo visits to different botanical events. Thank you for sharing your life with us. It is encouraging. I too went thru a few bad (no difficult) years. I think it makes us appreciate life more and slso those who have struggled with pain and chronic fatigue and worked thru it encourage others. Thanks again and enjoy the fruits for your holidays. Hi Ane, Thank you so much for your kind words. I certainly do appreciate every day that I am given, whether or not I’m in pain or not. And I’m grateful for all the beings I get to share space with – family, friends, plants, animals . I hope you get to travel someday to see some of these interesting places. I will certainly keep sharing too. This looks great. Can I use white whole wheat? I have some of that on hand. you bet! That works just fine. What about white flour? I don’t have whole wheat and waned to make for the holidays. 😕 And can I cut into shapes (bone)?